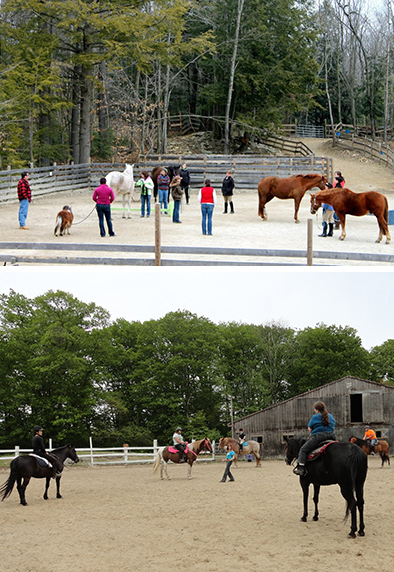 Human Horse Balance Ranch gives various Clinics and Workshops for groups as well as individuals. Group clinics / workshops are $75 – $95 per person depending on the topic/time; mostly are one day clinic from 9.30 am – 3.30 pm. Topics can be: TTouch workshop / Groundwork / Spring clinic (building your horse back up) / Riding from true Connection (fluidity riding) etc. Individual clinics / workshop are tailor made and run mostly for 2 hours for $90, the client can work either with one of our own horse or trailer in her/his own horse to work with. Clients can present any topic they want to work on. Problem-solving workshops or trailer loading workshops are possible too. Paula Lambie is a Master Certified Integrated Clinician as well as Integrated Riding Instructor and Integrated Horsemanship practitioner.